So. It’s been one hell of a week. While I’m not using this blog for political musings (not right now, at least) I will say that the act of knitting and the mindfulness it helps to bring about, the way that it gets me out of my head and focusing instead on something beautiful and practical, the pleasure it brings through creating something personal and pleasing out of simple tools and yarn – all of these things are very much appreciated in my world right now. Anything which helps to keep your head healthy during dark times will always be worthwhile. 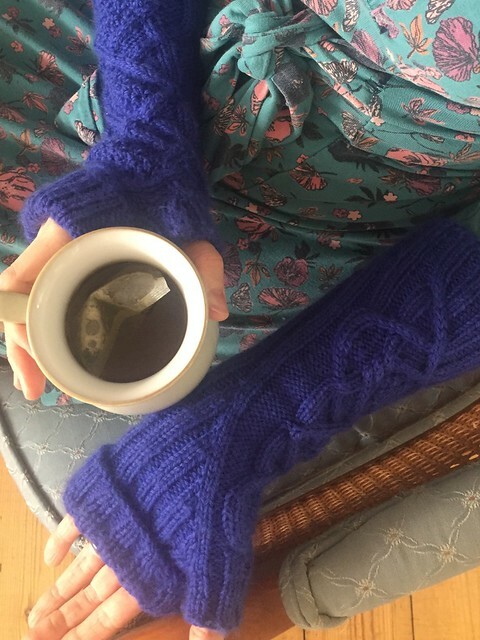 Back to more classic blogging – here’s a finished project which I gave a preview of the other week: my Inglis Mitts (pattern by Ysolda Teague). Here’s a confession: I didn’t love making these. Especially the first mitt – I felt a bit conflicted as I was knitting it. Now part of that is that I came down with gastric flu while making it, so I temporarily unfairly equated it with feeling queasy (how awful would that be, having a Pavlov’s dog reaction to knitting where it makes you want to throw up? even the thought – the horror!). Happily I was able to knit through that point, but even so I wasn’t totally in love with what was coming together in my hands. I think it’s the cable pattern – it’s clever but fiddly, and the end result is a bit clunky. Actually, I think I’m so used to beautiful flowing cables in my Driftwood Hoody that any other cable pattern right now suffers in comparison. Also: I’m using DK yarn not sport weight, so the whole thing is a bit beefier than Ysolda’s pretty photos accompanying her pattern. This is not my favourite photo of myself, but I do like the way the gloves look. 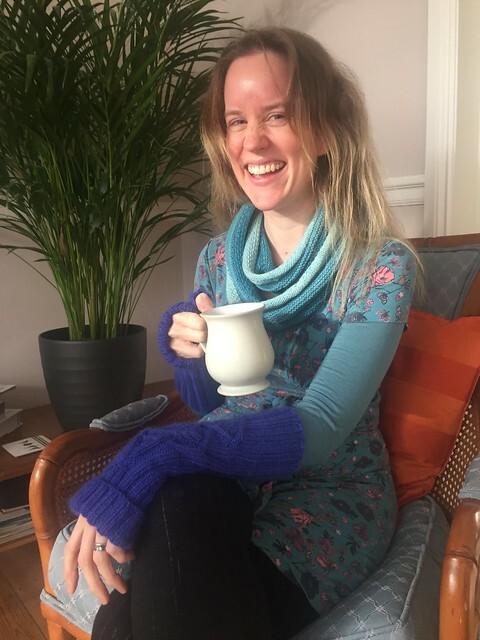 This blog is totally a vanity blog as well as a knitting one, but trying to squash that vanity right now! HOWEVER, the good news is that I do like these a lot now that they’re finished. I really like the thumb construction and the ribbing. They are also VERY warm and VERY soft, and I’ve timed it perfectly because it’s been bloody cold this week. When I’m not wearing them for a quick photoshoot the gauntlets usually sit cosily under my jumper and coat and they keep me gorgeously warm. Also they were quick quick quick – it’s been too long since I last had a two-week project. The yarn is Jon Arbon’s Knit by Numbers DK, and it’s my first time using it. It is very nice indeed to knit with – it obviously comes in pretty much any colour you can possibly imagine, and the yarn itself creates this gorgeous plump fabric. It is a tiny bit pilly/sheddy now I’ve been wearing the mitts all week, but I knew before I started that it was perhaps a bit soft for gloves really (it’s 100% merino). However I spoke to a friendly lady womanning the Jon Arbon stall at Yarnporium last weekend, and she reassured me that the yarn will do this to an extent to work out the short fibres – when they’re gone, it’ll firm up. In the meantime these are a toasty addition to my winter wardrobe and I’m very grateful for them. Some useful links – I used this photo tutorial as a reminder for doing a tubular cast-on because it’s been an age since I last did it. Cabling without a cable needle makes knitting something so cable-heavy much quicker and more fun. 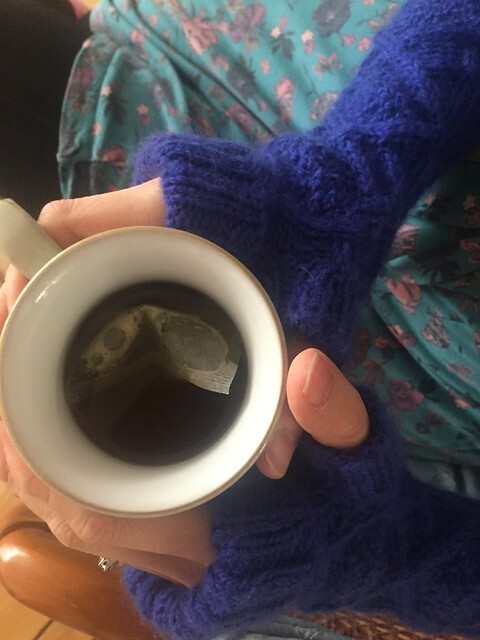 Oh, and this is my newest favourite knitting tip – have a look at this link for a GENIUS way of finishing a circular bind-off which is complete invisible. It’s so easy and so clever! Next Post Sneak peeks and party season!